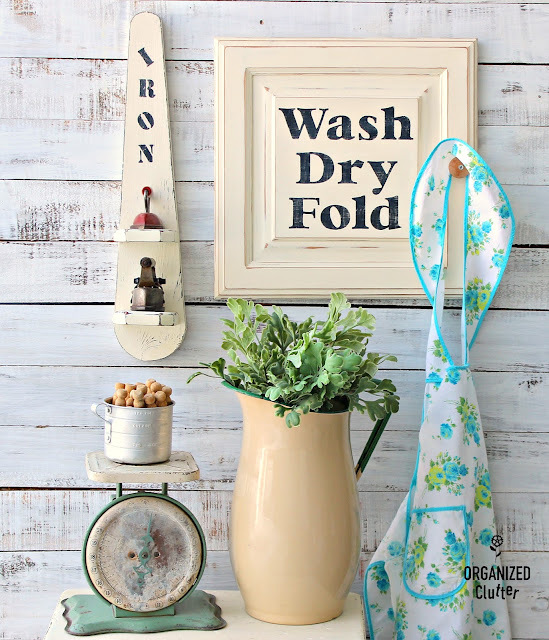 I upcycled another one of my cabinet doors from our local Menard's! This one is a Brinkman Arched Door Style from Schrock Cabinetry. While purchasing paint at Menard's, a local home improvement center, I purchased several of its discontinued cabinet door styles for $5 each. I thought this was a great deal as I don't have close access to the $1 cabinet doors at salvage shops. I painted my door with Annie Sloan Chalk Paint in French Linen. It took two coats. Then I used a combination of 220 grit sandpaper to smooth out the brush strokes and a damp rag rubbed over edges to remove paint but not the dark finish underneath. 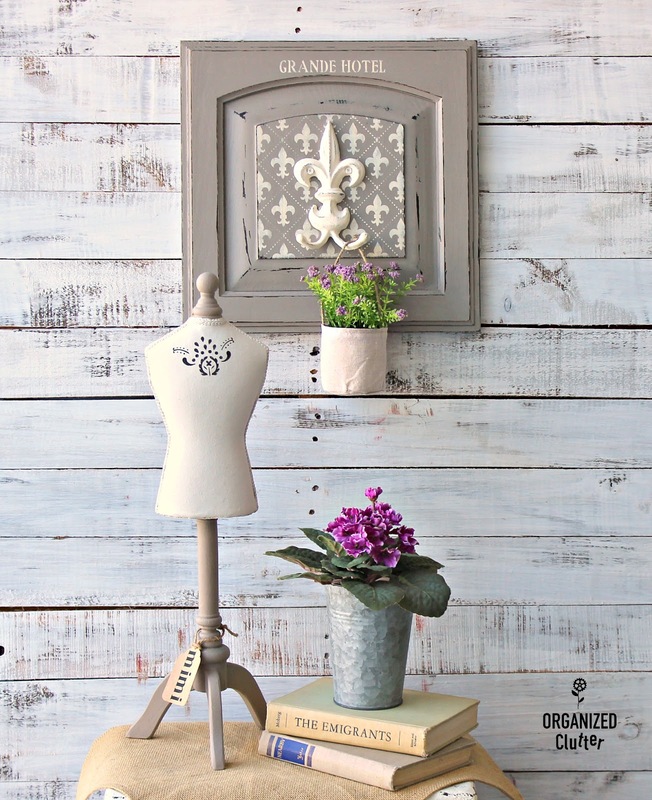 I found this very inexpensive Fleur de Lis Stencil sheet at a Walmart store in Fort Frances, Ontario. 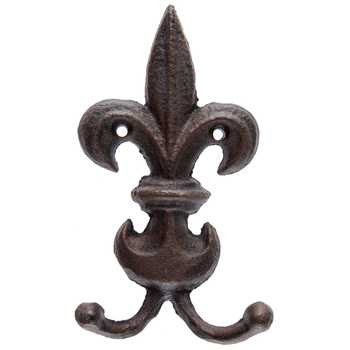 It had a pattern strip of small fleur de lis, and three larger ones on the right. I centered the patterned strip on the center of the cabinet door arch, and taped it in place with blue painter's tape. I had to move the stencil from left to right to fill the entire area. I used one of my Dreamweaver stencil brushes and Ceramcoat Butter Cream craft paint to add the stencil. I also added "Grande Hotel" from my Deco Art Andy Skinner Stencil - French Elements . I painted it with Chalked Paint in Chiffon Cream , and lightly wet distressed the raised areas. The Hobby Lobby hooks do not come with screws, so find a wood screw that is not too long for the cabinet door and also fits through the hole. I sealed the cabinet door with two coats of Varathane Water Based Polyurethane in Matte Finish . 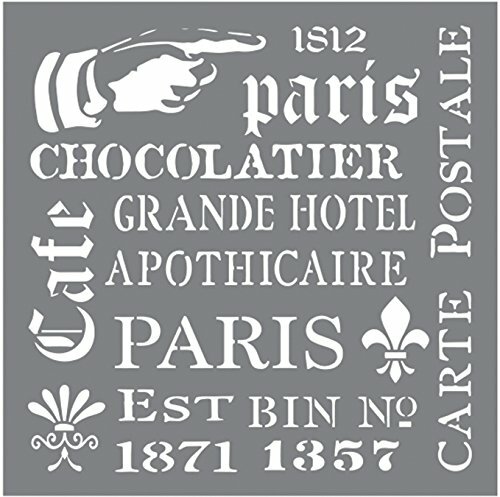 I have used this product in both satin and matte finish. Water based poly does not yellow. After adding the hook, I touched up the screw heads with my Chalked Paint in Chiffon Cream. 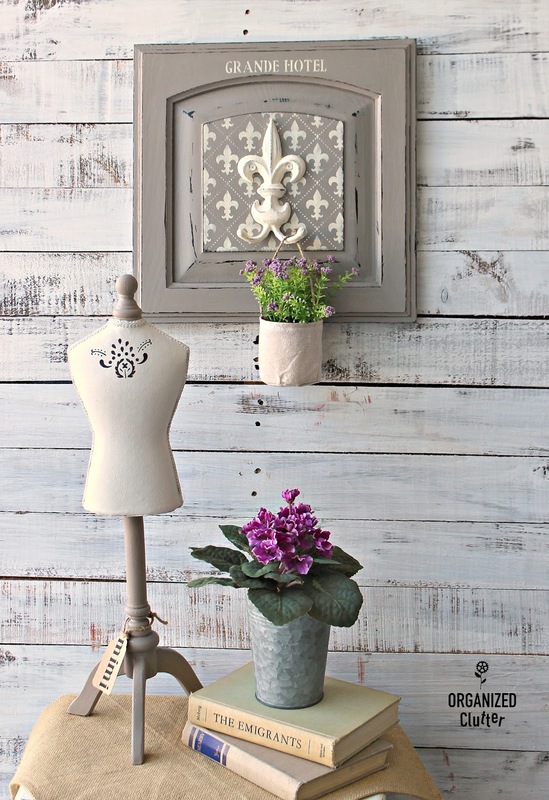 My project is perfect for hanging decor, like this faux alyssum, or even coats and scarves. 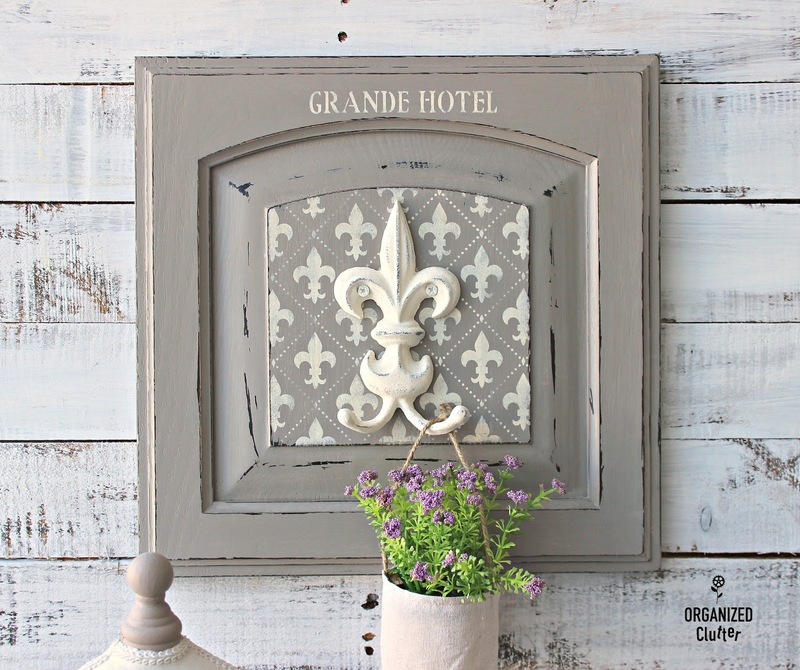 I just love Annie Sloan Paint in French Linen. Such a warm gray. 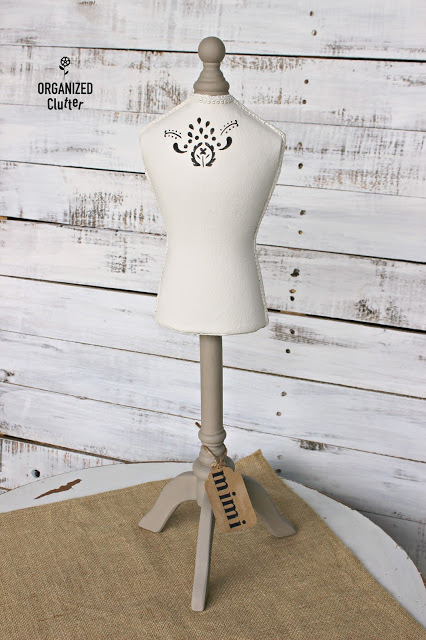 Mimi is a thrift shop jewelry mannequin upcycled HERE. My first Menard's display cabinet door was up-cycled HERE. As always Carlene you have put together another great wall decoration with imagination, paint, and a piece of neat metal. Pinned. Love your recycled cabinet doors. Here's to a great Sunday, create on! I usually don't do comments, but your re-purpose of the cabinet door is spot on. I am definitely going to try a project like it. It won't turn out as nice as yours but need to start somewhere. Thank you! My husband recently came home with a few cupboard doors he purchased at the reStore. I had no idea what I was going to do with them...but thanks to you and your great ideas I do now!! I wish I had a reStore around here! I always love your projects and the little vignettes you make with them! Very soon now, we'll be out in our gardens. Thank you! Not soon enough!